Oxford College students enjoy playing Cards Against Humanity, Monopoly, and other games from the Oxford College Library’s game collection, especially on the library’s game night. 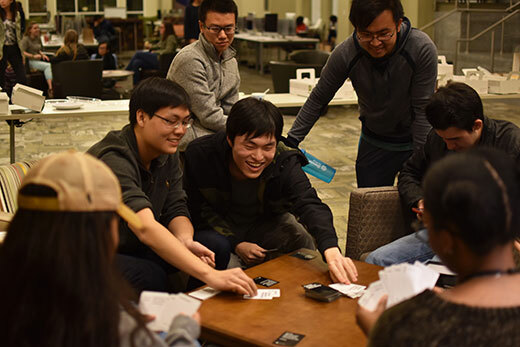 This image is from Game Night in March 2018. Credit: June Kwon/courtesy Oxford College Library. The Oxford College Library’s tabletop game collection provides relaxation in spades. The collection, which debuted in fall 2017, has become a great success with students, who use it to socialize and reduce stress amid demanding academics. Phoebe Lei, a second-year student in Oxford’s International Student Association, especially likes Monopoly, which pushes her to “think strategically.” Lei is also excited about Oxford’s games because they provide “a great opportunity to socialize and make new friends while having fun,” she says. Since fall 2015, the library has hosted a Game Night each semester so that students can relax before their final exams. Game Nights have become very popular: each semester, over 170 students compete in video game tournaments, narrate harrowing sessions of Werewolf (a roleplaying party game), and crack escape rooms created in the library. Students have been crucial to the curation process, shaping the game collection’s initial development through a survey taken at Oxford’s spring 2017 Game Night. Student employees continue to help by researching academic library game collections, creating an A-Z guide, and maintaining Oxford’s games by checking their pieces once they are returned. Students outside the library are getting involved, too. Ethan Wang is a second-year student and president of Games, Cards, and Pieces, a new club for board games at Oxford. “The board game collection gives me time to relax and just have fun,” allowing him to “mentally recharge,” he says. Staff members are equally excited about the games. Oxford College Library dean Kitty McNeill provided funding and support for the collection. Archives coordinator Kerry Bowden assists with Game Nights and reaches out to student groups who want to use the games. Cataloging and acquisitions coordinator Paula Knight prepared the games for circulation. Baron helps plan Game Nights and develops uses for games in teaching. She also reaches out to students by working with Games, Cards, and Pieces, the SGA Library Committee, and Game Central Station. Oxford library staff spent a year checking BoardGameGeek rankings and researching other game collections (such as MidAmerica Nazarene University’s Center for Games & Learning) before purchasing the games in summer 2017. “Oxford College Library is a team-oriented environment, so all library staff played an important role,” Baron says. The next Game Night will take place on Friday, Nov. 16, 8 p.m. - midnight at the Oxford College Library.